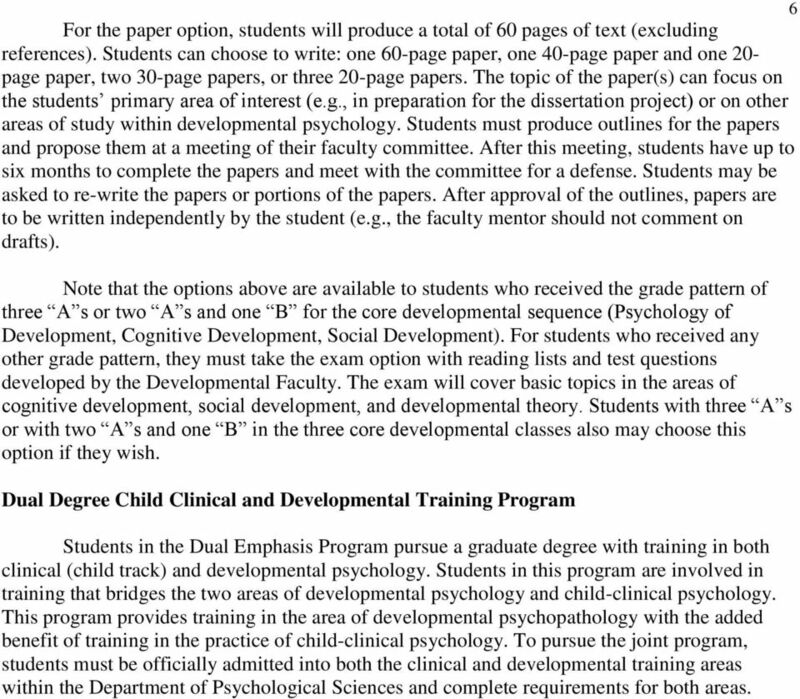 Download "Program of Study in Developmental Psychology. Department of Psychology. University of Missouri -- Columbia. June 2009"
2 participants while they are engaged in the project and terminate any activities that appear to create undue distress or might result in other harmful outcomes. 2 Accuracy in the analysis and reporting of scientific research is also of utmost importance. Science is essentially an honor system that is based on the trust of your colleagues. Misrepresenting or misreporting the results of your research is a violation of this trust and can not only damage your reputation as a scientist, it can result in other scientists wasting valuable time and resources in attempts to replicate or follow up on misreported findings. Finally, the ideas and the empirical testing and verification of these ideas are the currency of one s reputation as a scientist. In the conception and reporting of your research, it is important to acknowledge the work of other scientists that have contributed to the area and it is important not to represent the contributions of other scientists as your own. 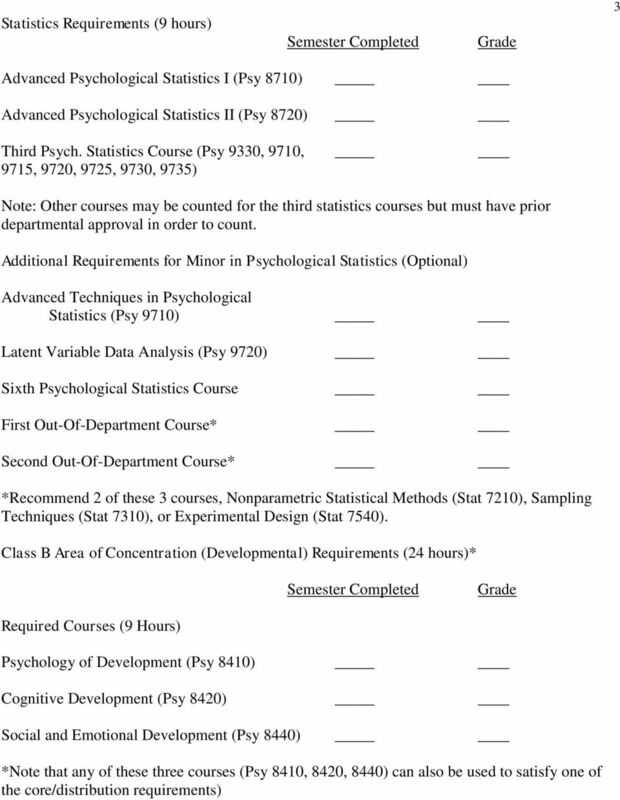 Graduate Courses and Requirements Ethics and Professional Issues (Psy 8910) Class A Core/Distribution Curriculum (9 hours)* Abnormal (Psy 8510, 8520, or 8530) Biological (Psy 8210) Cognitive (Psy 8110) Developmental (Psy 8410, 8420, 8430, 8440) Motivation/Personality (Psy 8610, 8620) Social (Psy 8310) *3 of 6 courses must be completed Note: Developmental Students are required to take a Developmental Core/Distribution course, and either a Cognitive Core/Distribution course or a Core/Distribution course in Motivation/Personality or Social, depending on whether the student's emphasis is on cognitive development or social development. Note that other courses may count as core/distribution courses if an area decides to offer them. 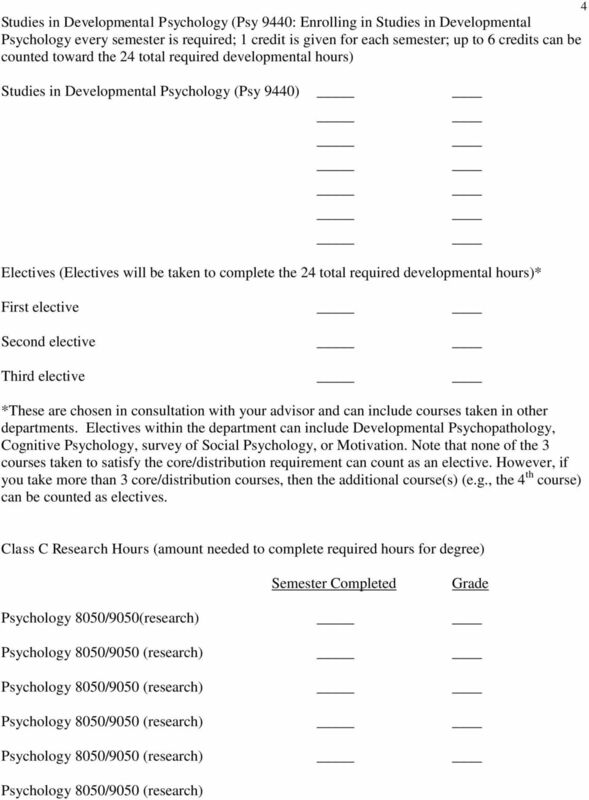 5 5 Psychology 8090/9090 (thesis/dissertation) Psychology 8090/9090 (thesis/dissertation) Psychology 8090/9090 (thesis/dissertation) Psychology 8090/9090 (thesis/dissertation) Psychology 8090/9090 (thesis/dissertation) Psychology 8090/9090 (thesis/dissertation) Comprehensive Examination As noted in the Departmental Graduate Student Handbook, to achieve candidacy for the doctoral degree, a comprehensive examination must be passed. 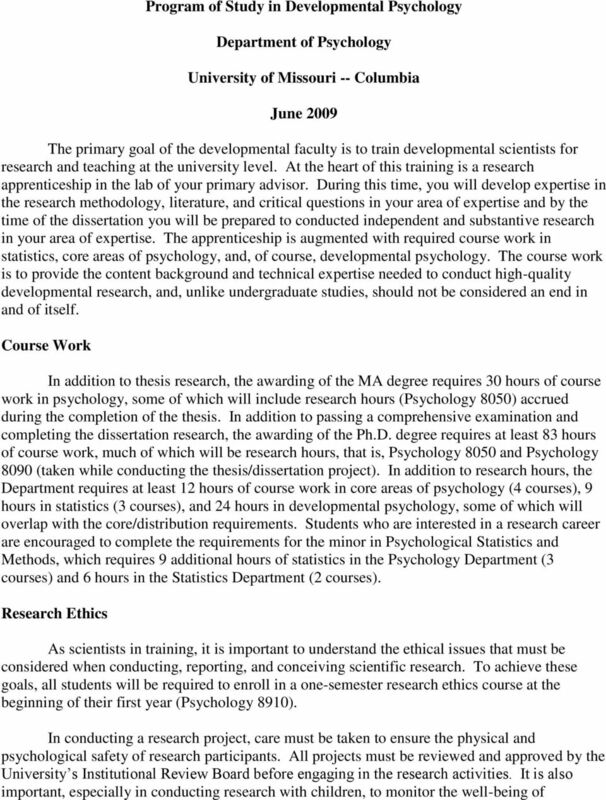 The exam cannot be taken before two years of residency and should be passed before work on the dissertation is begun. The typical candidate will complete all work related to the comprehensive exam or papers by the end of the fourth year. exam. 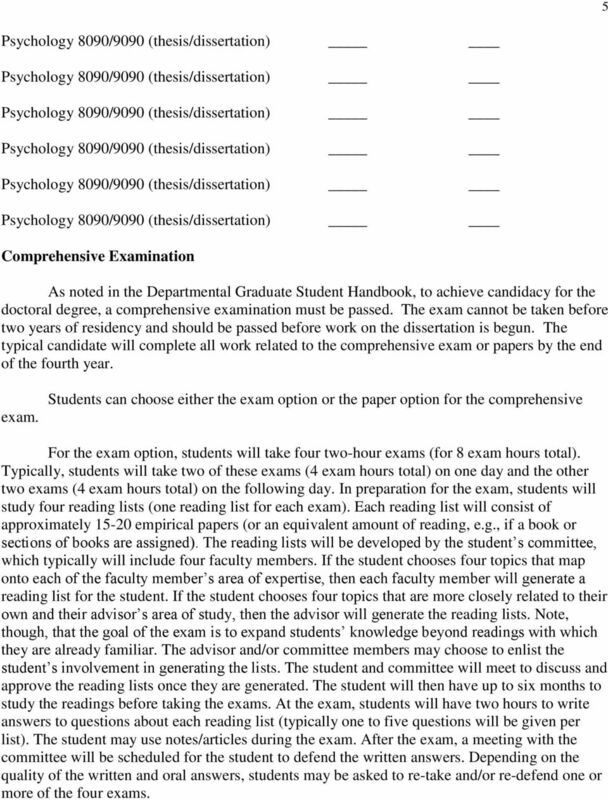 Students can choose either the exam option or the paper option for the comprehensive For the exam option, students will take four two-hour exams (for 8 exam hours total). Typically, students will take two of these exams (4 exam hours total) on one day and the other two exams (4 exam hours total) on the following day. In preparation for the exam, students will study four reading lists (one reading list for each exam). Each reading list will consist of approximately empirical papers (or an equivalent amount of reading, e.g., if a book or sections of books are assigned). The reading lists will be developed by the student s committee, which typically will include four faculty members. If the student chooses four topics that map onto each of the faculty member s area of expertise, then each faculty member will generate a reading list for the student. If the student chooses four topics that are more closely related to their own and their advisor s area of study, then the advisor will generate the reading lists. Note, though, that the goal of the exam is to expand students knowledge beyond readings with which they are already familiar. The advisor and/or committee members may choose to enlist the student s involvement in generating the lists. The student and committee will meet to discuss and approve the reading lists once they are generated. The student will then have up to six months to study the readings before taking the exams. At the exam, students will have two hours to write answers to questions about each reading list (typically one to five questions will be given per list). The student may use notes/articles during the exam. After the exam, a meeting with the committee will be scheduled for the student to defend the written answers. Depending on the quality of the written and oral answers, students may be asked to re-take and/or re-defend one or more of the four exams. Program Planning Guide. Counseling Psychology Program Department of Psychology Southern Illinois University. Revised Spring, 2014. Environmental Science/ Environmental Geology M. S.
Ph.D. Applied Behavior Analysis Program Guidebook 2014-2015 NOTE: 1) This guidebook is subject to change. If it does, students will be notified via email and will be provided with the revised version. 1 Procedures, Guidelines, and Timelines Updated Nov. 2014 These do not replace the Graduate Catalog, but rather are designed to address some specific issues not addressed or clarify the specific procedure. 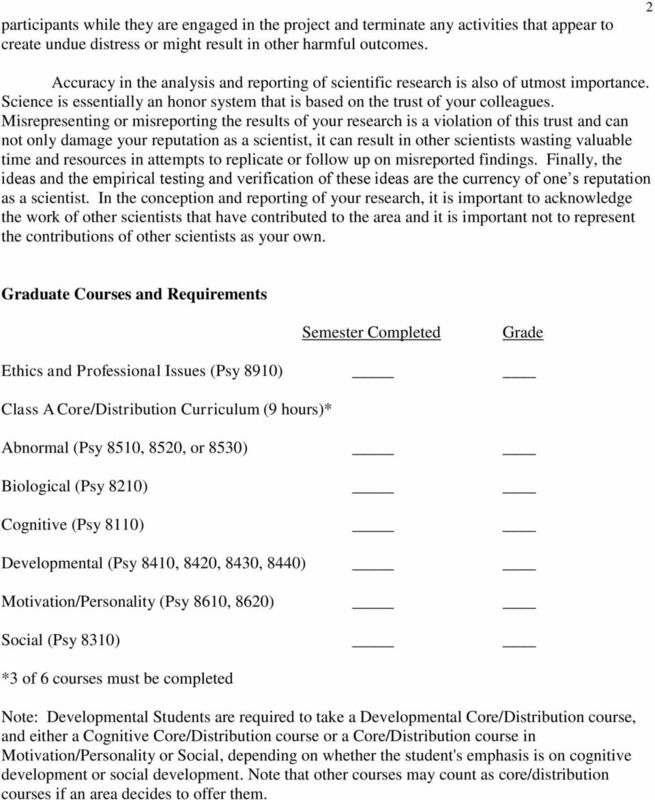 Timeline to Degree Molecular Biology Ph.D.
VANDERBILT UNIVERSITY DEPARTMENT OF SOCIOLOGY 1 GRADUATE PROGRAM GUIDE Last revision, July 2014: These requirements apply to all students entering the graduate program in Fall 2014 and proceeding years. Note: Be sure to specify the program in which you are interested in when sending mail.